Lev Nikolayevich Tolstoy, better known as Leo Tolstoy, was born on September 9, 1828 in Tula province of Russia. He was the youngest of four sons. Tolstoy's mother died early, so his father's cousin took care of him. After seven years, Tolstoy's father died and their aunt became their guardian. Tolstoy received his early education at home. In 1844, he joined an Oriental language program at the University of Kazan. But he failed to excel as a student. He left the university and returned to his parents estate, willing to be a farmer. Soon he joined the army and Fought the famous crimean war(1853-56). While working as a soldier, he wrote an autobiographical story called Childhood. In 1852, he submitted the story to the Contemporary, the most popular journal of that time. The story was accepted by the journal and it became Tolstoy's first published work. Tolstoy continued to write while at battle during the crimean war. After the war , Tolstoy left the army and came back to Russia. He published the second part and the third part of his autobiographical trilogy, entitled Boyhood and Youth. In 1862, he married Sophya, the daughter of a Doctor. From the early 186os, Tolstoy toiled over his Novel 'War and Peace' . The novel was completed in 1869. Both readers and critics became overwhelmed when they read it. It depicted the historical accounts of the Napoleonic Wars, combined with thoughtful development of realistic yet fictitious characters . Following' War and Peace', Tolstoy published' Anna Karenina 'serially during 1873- 1877. It fictionalized some events of Tolstoy's life, especially the love episode between Kitty and Levin , which is said to resemble Tolstoy's courtship with his own wife. By that time Tolstoy had became quite famous and wealthy due to the royalties he earned from his novels. Among his later works, the 'Death of Ivan llych' (1886) and' Father Sergius' were quite successful. He also wrote a number of short stories, plays and essays. 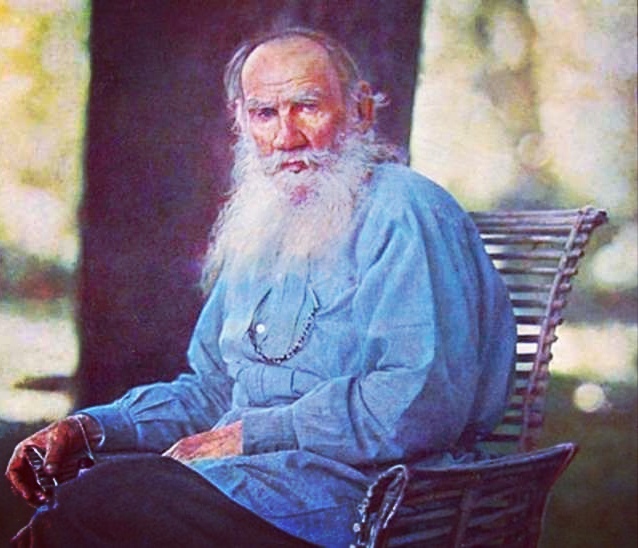 At one time Tolstoy suffered from a spiritual crisis, and was ousted from the Russian Orthodox Church. He received Huge International acclaim. His ideas of non - violent resistance influenced great social leaders like Mahatma Gandhi and Martin Luther King, Junior. He died in the year 1980 and was buried at his family estate in the Tula province. Tolstoy earned fame because his literature exposes human conditions with realism. His writings reflect the society in which he lived. He is remembered for his works of fiction. His contribution to expansion of Christian philosophy is also remarkable. His philosophy helps to form new ideas of life and happiness. He was a man of strict morals and he explored them logically and convincingly in his novels and short stories. There are many movies which are based on the incidents of his life. Even today his works inspire a wide variety of people. Many of his works are undoubtedly the classics of world literature. 'War and Peace' is no doubt one of the best classic novels. It is of course epic in scale and grandeur. Tolstoy, the Russian writer, is a master of realistic fiction. He is one of the greatest novelist of the world. He is also known as a moral and religious teacher. His subject matter: Most critics have praised Tolstoy for his ability to sketch human responses to different conditions. He observed even the smallest changes of consciousness. Human beings appear to be his main area of interest. The subject matter of his novels and short stories is mainly a quest for the meaning of life. However his interest in depicting the social condition is revealed in novels like 'Anna Karenina'. Tolstoy's writing style is famous for the ease with which he makes his message clear and concise. His short stories often conclude with a moral message through which Tolstoy expands The Horizon of the minds of the audience and readers. He uses the form of parable and folklore integrating his strong moral beliefs. Most of his works are written from the point of an omniscient narrator. His credit lies in the fact that he uses ordinary events to deal with issues like war, religion, feminism etc. Tolstoy is famous not only for his novels, but also for his moral and political beliefs which have inspired both anarchist and pacifist. He was a brooding moralist and a critic of organised religion. But he often failed to reconcile to his own ideas. His moral attacks on capitalism are distinctly evident in his later works. Tolstoy's belief in non - violence deeply influenced Mahatma Gandhi and Martin Luther King, Junior. Gandhiji's thoughts on love and search for truth were influenced by Tolstoy's pacifism and nonviolent resistance. Martin Luther King, who fought for the equal rights of African - Americans, used the strategy of nonviolent social protest after reading Tolstoy's 'The kingdom of God is within you' . In recent times, 'The Orange revolution' in Ukraine was the result of Tolstoy's continuing influence. The literary gifts of Tolstoy have assured him a high place in the world literature. His works are admired by readers through generations . But his irrationalist religious beliefs are so individualistic that they are less accepted than his literary works.